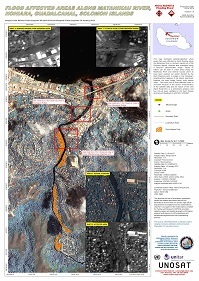 This map illustrates satellite-detected urban areas that were affected by flash flooding along the Matanikau River in Honiara, capital city of the Solomon Islands. Analysis was conducted using a Resurs-P panchromatic image. Traces of waters can be seen in urban areas along the Matakinau River and several houses seem to have been washed out and/or flooded by the flash flooding event. A bridge in the Chinatown neighbourhood appears to be totally destroyed, however the main bridge further north seems intact. The exact limit of flood affected zones is uncertain because of the sensor characteristics of the satellite data and the nature of the vent (flash flood).This is a preliminary analysis and has not yet been validated in the field. Please send ground feedback to UNITAR / UNOSAT.